These commercial floor decals are easy to apply with just a few tools needed to ensure a clean, professional sign to promote a trade show booth, retail POP display, or event information. The adhesive backer is repositionable and high-strength, allowing you to remove and re-apply in new locations while enduring up to 3 months of heavy foot trafffic. Ideal for use on concrete, stone, wood, tile, painted surfaces, glass, and more, these vinyl stickers are available in 4 stock shapes: circle, square, oval, and rectangle. Each graphic ranges 12" to 60" in width, ensuring a great lasting impression combined with fully custom artwork. Jeff: "First things first! Gather your supplies such as painters tape, a brayer and a scraper. Next, clean up your designated area for your decal application. Now tape the decal to the floor going all the way across the middle. Starting on one end, peel the decal away from the backing paper. Then tuck the backing paper underneath exposing the sticky side to adhere to the floor. Once you have the end stuck to the floor, you can remove the tape and grab the brayer and smooth out the wrinkles. After that, pull the backing paper from the decal and apply and smooth out the other end with the brayer as well. To remove, use the scraper to lift up one end and pull the decal until the sticky side is facing up. The decal can be re-applied to the backing for later use. Our Displays2go floor decals are re-positionable and can be applied on multiple surfaces such as carpet, concrete, tile, and hardwood flooring. On top of that, these durable vinyl decals can be cleaned over and over due to the textured laminate applied to them. Ideal for high foot traffic areas, such as trade shows and storefronts, they can withstand up to 3 months of continuous use. 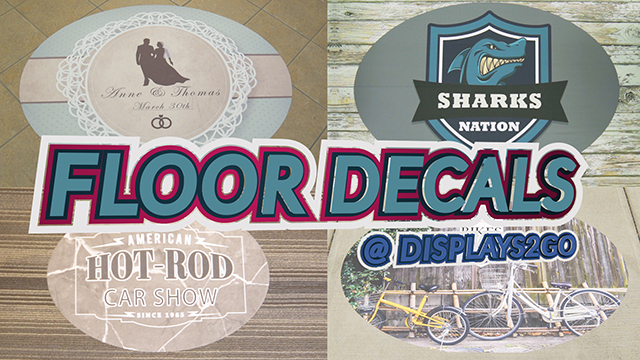 Our custom floor decals from Displays2go take a lickin’, and keep on stickin’!"